Every home contains plumbing fixtures. Tubs, sinks, toilets, faucets and showers are fixtures we are all familiar with. In addition to their evident functionality, these fixtures serve a crucial purpose in the plumbing mechanism. 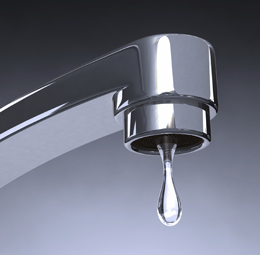 Leaky and/or overflowing fixtures can sometimes be the cause of plumbing problems. Existing fixtures can be repaired and new ones installed by your professional plumber. There are two individual plumbing systems within your home. One system brings fresh water into the home. The second system channels the wastewater through a drainage system. Pipes carry and lead fresh water to all fixtures, and drainpipes remove wastewater away from fixtures. Fixtures are in fact a bridging element between these two separate-but-conjoined systems. The fixtures not only serve as "first stop" for the drainpipes as they begin their way towards sewage facilities, they are also the "final stop" for the water supply pipes. Water warmed by the heater is carried by hot water lines to all the fixtures and appliances that make use of hot water. Each fixture includes a trap, either inside or outside it. A vital component, the trap serves to keep sewer gases and other unwanted smells out of your home. You know it as the curved section of the pipe found in your drainage system. If you find yourself facing a leak, don't panic! Simply find the water shut off valve, located in the vicinity of most fixtures, and turn it to the right as far as it will go. Besides being functional, fixtures can also be visually pleasing objects that contribute to your home aesthetics. Plumbing fixture manufacturers sell decorative bathtubs, sinks, and faucets. Order the fixtures online, and they will be delivered directly to your home. Commercial fixtures In places of business, you may prefer to purchase sensor operated plumbing fixtures such as toilets and faucets. These prevent the spread of germs and bacteria and are more cost effective.